we are leading manufacturer of coat suit stand we do customized coat stand too. 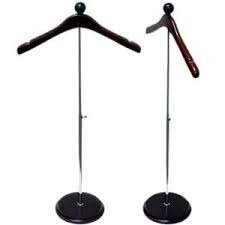 coat Suit Stands offered by us can be availed in a variety of designs and sizes.known for its lightweight quality, durability and versatile applications, the entire range of these hangers is fabricated with beat quality steel, wooden and brass coated material that ensure an appealing look and impeccable finish. We also offer these products with customized solutions in terms of size, design and colors at cost effective rates. Our clients appreciate us for prompt delivery of these products. For catering the variegated needs of our clients, we are deeply engrossed in offering a qualitative array of Coat Stand. Our range is appreciated across the nation and explore our workers' sense of discretion through this coat stand. Culmination of creativity excellent craftsmanship, this wooden art ware is nicely shaped into fascinating designs. The hooks on top can be used to hang coats other apparels, while the bottom stand is useful to put umbrella, walking stick other items. This stand is also available in numerous other designs as specified by clients. We are leading names in the industry, offering wide range of Coat Hanger Rack that is manufactured sourcing quality assured raw components from certified vendor base. This is High Standard Steel Coat Stand with wooden Hanger. This is lacquered for long lasting finish. They are valued among the clients for elegant looks, exceptional finishing and dimensional accuracy. We offer them in standard sizes and dimensions and are in adherence with set quality standards. Suit Stands offered by us can be availed in a variety of designs and sizes.known for its lightweight quality, durability and versatile applications, the entire range of these hangers is fabricated with beat quality steel, wooden and brass coated material that ensure an appealing look and impeccable finish. We also offer these products with customized solutions in terms of size, design and colors at cost effective rates. Our clients appreciate us for prompt delivery of these products. We are offering a varied variety of Coat Suit Stands in designs and sizes. Renowned for their lightweight quality, durability and flexible applications, the complete range of these hangers are made with optimum quality steel, wooden and brass coated material which assure an appealing look and outstanding finish. We also provide these items with custom-made alternatives in terms of size, design and colors at cost effective prices. Our clientele take pleasure in us for immediate delivery of these items. Our esteemed clients can avail from us a comprehensive range ofCoat Hanger. This high Coat Hanger is designed and developed to serve the diverse utilities of various industries. Our premier quality Coat Hanger is mostly used in hotels and other service sectors to hang oats and other apparels in a systematic fashion. These superior make Coat Hanger are widely acknowledged for their quality, durability, efficiency and optimum performance. wooden Suit Stands offered by us can be availed in a variety of designs and sizes.known for its lightweight quality, durability and versatile applications, the entire range of these hangers is fabricated with beat quality steel, wooden and brass coated material that ensure an appealing look and impeccable finish. We also offer these products with customized solutions in terms of size, design and colors at cost effective rates. Our clients appreciate us for prompt delivery of these products. Plastic Injection Molding granules, Hanger, Wooden Products, Plastic Hanger, Wooden Hangers, Metal hanger-Resin hanger ,PVC Bags & Pouches ,Plastic Hooks, Coat Suit Stand and many more packaging items. These fine quality Wooden Coat Rack are manufactured by using very high quality wood which ensures high durability at its user end. These Wooden Coat Rack are widely available in various designer and eye catching patterns. We are leading names in the industry, offering wide range of Coat Hanger that is manufactured sourcing quality assured raw components from certified vendor base. They are valued among the clients for elegant looks, exceptional finishing and dimensional accuracy. We offer them in standard sizes and dimensions and are in adherence with set quality standards. Our organization is counted among the prominent manufacturers and suppliers of Coat Stand. The coat stands offered by us displays the creativity & excellent craftsmanship of our professionals. Our experts make proper utilization of wooden art ware into fascinating designs to provide unparalleled range. We offer these stands to the customers at market-leading rates. We are manufacturer for all types of coat stand . We do customized too if its in bulk in qty. We are engaged in offering a wide range of Customized Coat Stand to our esteemed clients. These are also customized as per their requirements. The coat stands occupies very less space and can be placed anywhere in the room. We are engaged in offering a wide range of Coat Stand to our esteemed clients. These are also customized as per their requirements. The coat stands occupies very less space and can be placed anywhere in the room. Looking for COAT SUIT STAND ?